Our perceptions of the age of a subject are frequently based on our common experience with similar subjects. Most people have some ability to guess the age of children with seemingly very little prior information. We might call this ability to guess age our intuition but this “intuition” is the scientific method working automatically in our minds. Our perception of a child’s age is shaped by our many experiences with children over our lifetime. You could say it is shaped by a lifetime of data collection of characters like height or behavior patterns. It is the combination of many pieces of evidence and are experiences with interpreting that evidence that we use to generate a reasonable hypothesis. But what happens when we are confronted with something very unfamiliar to us? If we don’t have any experience – you could call this common sense – to guide us, how can we generate reasonable hypothesis to explain what we are seeing? The concept of the age of the Earth is just such a concept that is very difficult for many people to wrap their minds around because our ordinary experience doesn’t allow them to easily comprehend millions of years. A few years ago I taught a course for our honors college. The class included 18 students from diverse disciplines. One learning objective of the course was to have students improve their critical thinking skills while engaging in subject material in the historical sciences. In this seminar and discussion-format course I had chosen the theme of the natural history of the Hawaiian Islands. We were going to discuss the geological history of the islands and the origin of the flora and the fauna. At our first meeting I gave the class a homework assignment that required that they each visit the Mars Rover JPL/NASA website and look through the recent raw images feeds from the Opportunity rover which was – and still is – roaming the surface of Mars taking pictures. They had to select one image and write a one page description of what they hypothesized was the history of the scene in that image including a time-line of when each of the events in their historical narrative happened. The next class period – a 2-hour time slot – I presented each of their selected images and each student had to briefly go over their proposed time-line and other students could ask questions and provide suggestions for improving their time-line of events. Most of the students selected images that included a crater or large rocks on a sandy landscape. The typical historical time-line included the formation of the bedrock, an objected striking that bedrock and then erosion of the crater remains resulting in the present-day image. The basic geological principles of stratigraphy or superposition seemed to be intuitive to all the students. They all understood that the scene they were witnessing was the result of a series of historical events culminating in the present day image. However intuition broke down completely when they were forced to propose how long each of these geological features would take to form. The most glaring failure of common experience/intuition was their estimates of the rate of erosion of rock formations. Take a look at the three images below. All of these have been observed by the Opportunity Rover. The first is a small crater that appears to be rather fresh given the somewhat jagged rocks strewn on the surface of the sandy plain. The second is a large crater named Endurance Crater and it looks older since there are no large rocks on the sandy plain around the crater’s edge. 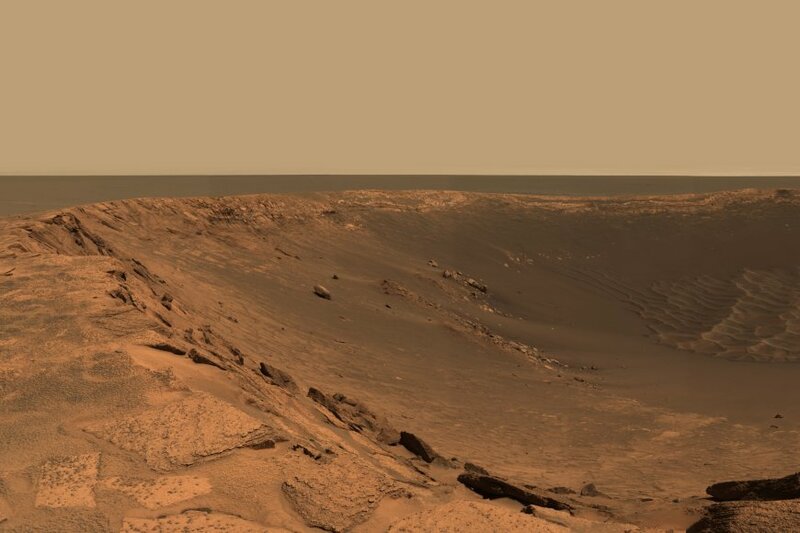 The third is Endeavour Crater which is a 13 mile-wide crater that Opportunity has spent the past 3 or more years exploring and is where the rover is today. 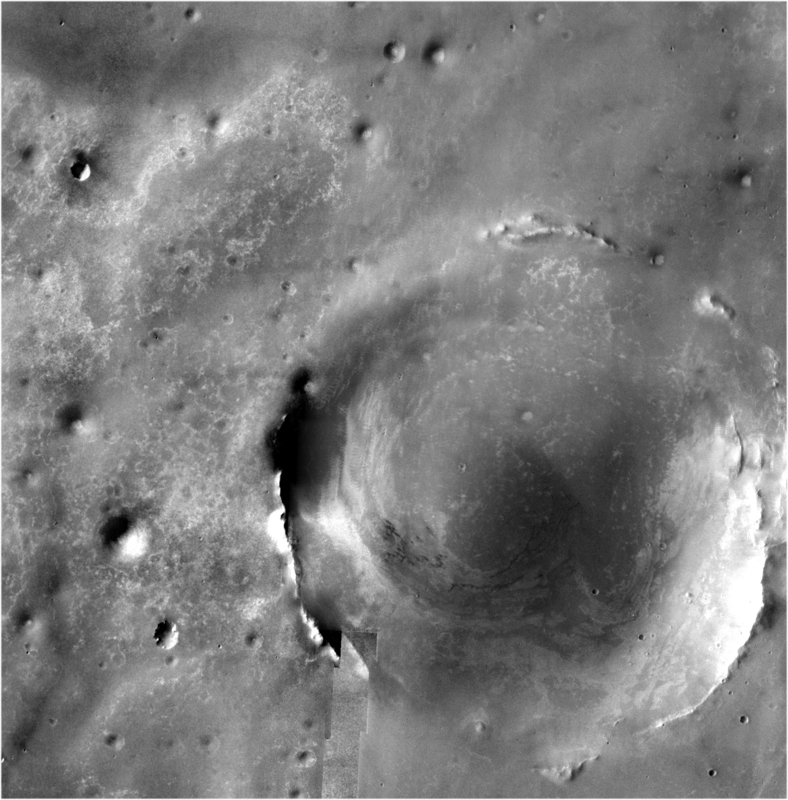 This crater has younger craters inside the crater and looks much older than the first two craters. 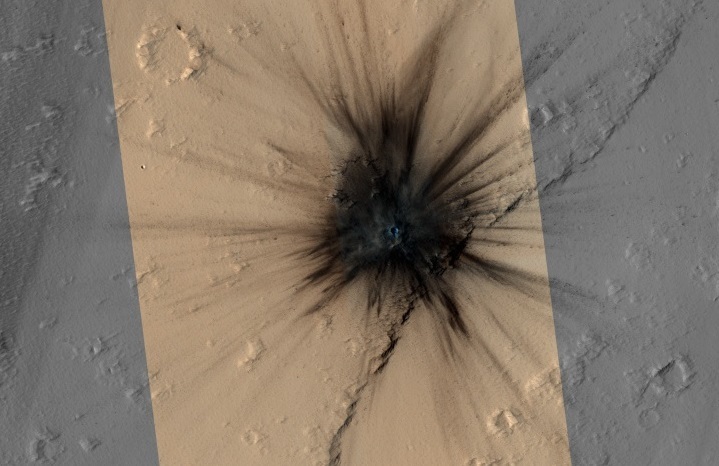 Establishing the relative ages of these craters is as intuitive as comparing a baby with a 3-year-old and a teenager. But just how much different in age are these craters? There wasn’t a single student that thought that any of these craters were more than 100,000 years old. Most said they would guess that the youngest-looking crater was a few years old, maybe 100s of years old and possibly 100os of years old. They thought the largest crater that had younger-looking craters inside was clearly older and thus may have been 100,000 years old. I then had the students debate among themselves what processes could have been responsible for eroding these rocks and craters and they all concluded it had to be wind. But even after they convinced themselves that what they were seeing was the result of wind erosion they found it very difficult to comprehend the likely ages of these craters. The first somewhat fresh-looking crater is very likely to be 100,000 years and possibly much older. In the case of Endurance and Endeavor craters an age of 100 to 500 million years may still be an underestimate. My students, many of whom were engineering majors, really thought it would only take a 1000 years or so to erode the rocks in the pictures above. As the class proceeded, I discovered that only one of the 18 students was sympathetic to a young-earth creationist’ perspective. So the student didn’t have a bias against thinking that Mars was billions of years old. They simply just couldn’t fathom the time required for wind to cause this action. Throughout the course we came back to these craters. 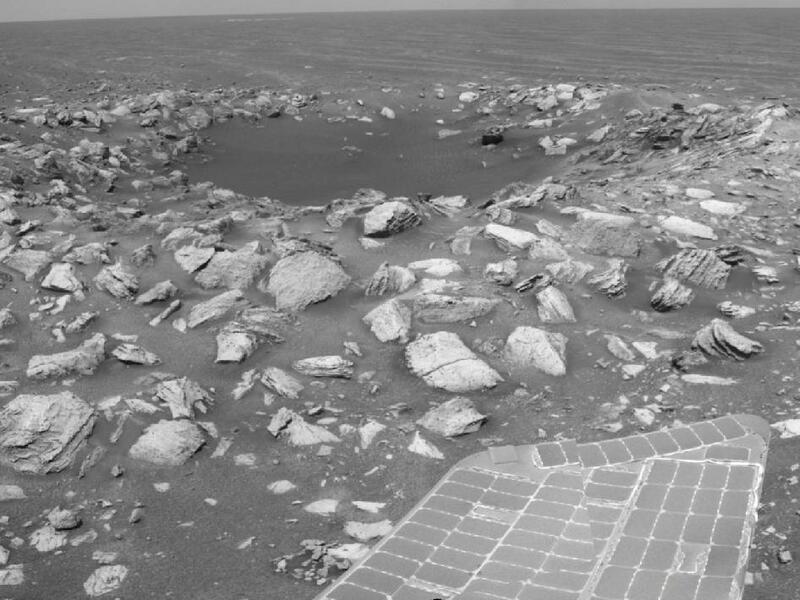 We looked at the evidence for present and inferred past wind speeds on Mars. Then we asked basic questions about how much dust could be suspended in the wind given different air densities, the friction that dust would cause when striking a rock and so forth. Finally the concept that the rate of erosion on Mars is very low and the time then required to shape any of the rocks that we see through the eyes of the rovers is quite considerable began to take hold (For example: Cosmogenic Dating Methods Allow Estimation of Erosion Rates on Mars). I’ll never forget the initial utter disbelief of these students that this landscape could be ancient. It was a reminder to me that many of the concepts in science that are so obvious to scientists are not obvious to the majority of the public. Creationists like Ken Ham can use these common misconceptions to their advantage because they can simply confirm to their audience what they probably already think: that these features can all be squeezed into 10,000 years or less because that is a really long time. I don’t have a reference handy but I have certainly read YEC materials that make that suggestion. Even Henry Morris had talked about the Flood having “universal” effects possibly effecting the moon and other planets. Some YECs think that the flood was initiated by a large or many large meteor strikes. If that is the case then that suggests that the solar system may have had more activity with large objects in new paths that might also have struck Mars with watery comets. This may be the time when the planets got all their craters including the moon. Yep, and all this amazing action happened just 4000 years ago but today it has all subsided except for a few stray meteors and comets left wandering the solar system.